Time to sign up for the free Tidal trial again. Looks like Nicki Minaj isn't done with giving presents yet. 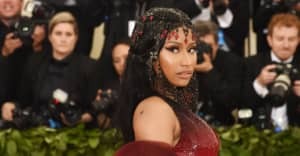 Earlier this week, the rapper released three surprise tracks, "Regrets In Your Tears," "Changed It," and "No Frauds," a response track to Remy Ma's "shETHER." Since their release, all three tracks have showed up on the iTunes top 10 list. Now, the rapper has taken to Twitter to announce another unnamed project for Tidal that she says will drop between "now & Monday." Guess it's time to sign up for another Tidal trial. In the meantime, see her tweets about the surprise below.